Sign in to Online Banking and select your account from the Accounts Overview page, then go to the Information & Services tab. Your account number can be displayed by clicking the Show link in the Account Details section. Use our ATM & Banking Center Locator. Bank of America banking centers are locations where you can transact your business in person. You can use our ATM & Banking Center Locator to find the hours of the banking center near you. If you want to open a personal account, you'll find checking account options, account selector tools and an account comparison chart right online. You can request a stop payment on a personal check via Online Banking or by calling customer service at 1.800.432.1000 Monday through Friday from 7 a.m. to 10 p.m.; Saturday and Sunday from 8 a.m. to 5 p.m., local time or by calling the number on your statement. To request a stop payment via Online Banking, please select the account and click Stop payment on a check under Services. Then complete the required information. You will need to provide the following information: check number, date written, exact amount, and payee. If the amount and check number are not exact, the check may be paid. The stop payment cannot be placed on an item that has already been presented. A stop payment on a personal check will be effective for 6 months. We ask that you contact us if any information on the confirmation is not correct. For further information regarding stop payments, stop payment fees or regarding bank and customer responsibilities, please refer to your Deposit Agreement and Disclosures brochure. A hold means that we've received your check for deposit, but you won't be able to use the funds until the hold period has expired. Holds are placed to help protect both you and us from losses that could occur when a deposited item is returned unpaid. Hold periods are typically 2 to 5 business days, and may extend longer in unusual circumstances. If the deposited item is returned unpaid before the hold expires, those funds will not be made available to you. If the deposited item is returned after the hold expired, we charge your account for the amount of the item. We use many factors to determine if a deposit hold will be placed, including your account history, account balances, the maker, the dollar amount and type of check being deposited. Situations that typically cause a check to be held include: There is reason to believe the funds may be uncollectable The source of the check The account has been open for 30 days or less The account has repeated overdrafts in the last 6 months The check is in an amount greater than $5,000 or larger than you normally deposit Fraud is suspected The check was previously deposited, then returned unpaid The check was not properly endorsed Emergency situations, including computer or communication failure Incorrect routing or account number information on a deposit slip If we place a hold on a deposit you make at a financial center or ATM with Teller Assist, your teller will provide you the hold notification at the time of the deposit. If we place a hold on an ATM or mobile check deposit, most often we'll notify you on the receipt or confirmation page. If we place a hold at a later time, we'll send you a notice by mail. These hold notices help prevent you from inadvertently overdrawing your account. To avoid holds, you can use: Direct deposit: you can avoid having a hold placed on your check by using direct deposit instead. If you have recurring income like a paycheck, pension payment or Social Security check, arrange to receive it by direct deposit. Person-to-person transfers: consider using a person-to-person transfer through Online Banking when sending money to another Bank of America customer. It's a secure and convenient alternative to writing and sending a check. Wire transfer: we credit your account the day we receive it. Wire transfers typically have to be set up for each transfer. In most cases, there is a fee for sending or receiving a wire transfer, but it can be worth the expense since you know the money will be there when you need it. The speed with which we make your deposited funds available depends on a number of factors, including how, when, and where you made your deposit. For example: By direct deposit: We credit your account on the day the deposit is scheduled to occur. In most cases, a direct deposit is the fastest and easiest way to get funds into your account. By wire transfer: We credit your account the day we receive it. Wire transfers typically have to be set up for each transfer. In most cases, there is a fee for sending or receiving a wire transfer, but it can be worth the expense since you know the money will be there when you need it. Cash with a teller or ATM: You can usually access it immediately at the teller or ATM. If you're not sure, ask your teller when the funds you deposited will be available. At an ATM (for consumer accounts): For check deposits, generally $200 of the deposit is available immediately, and the rest of your deposit is usually available the next business day. New accounts generally do not receive any immediate availability. For Business Accounts: check deposits are generally available the next business day. For more information on the circumstances under which a delay may occur, refer to the Deposit Agreement and Disclosures. Certain transactions you make to your checking accounts after the business day cut-off and before midnight* are included in the balance we use to pay transactions that night. This process may impact when fees apply to your accounts. The credits can help you avoid overdrafts, returned items and related fees. However, the debits may cause you to incur overdrafts, returned items and related fees. The After Business Day Cut-off transaction deadline is based on the state where you opened your account and is listed in the table below: After Business Day Cut-off Transaction Deadline: State Where Account Was Opened* After Business Day Cut-off Transaction Deadline AR,AZ,CA,IA,ID,IL,IN,KS,MI,MO,NM,NV,OK,OR,TX,WA 11:59 PM Central Time CT,DC,DE,FL,GA,MA,MD,ME,NC,NH,NJ,NY,PA,RI,SC,TN,VA 11:59 PM Eastern Time *may not be midnight local time in some states. The following credit transactions increase your balance used to pay transactions that night: cash deposited at an ATM or at a banking center, and transfers to your account from another Bank of America deposit account made at an ATM, at a banking center, through Online Banking or through Customer Service. The following debit transactions reduce your balance used to pay transactions that night: cash withdrawals made at an ATM or at a banking center, and transfers from your account made at an ATM, at a banking center, through Online Banking or through Customer Service. To maintain a positive balance you need to ensure you have adequate funds in your account or in an account you linked for overdraft protection. Learn more about Overdraft Protection to cover these transactions. The table below shows how transactions you make affect the balance we use to pay transactions, and the date that a transaction will appear on your account statement. Transaction Completed Included in Balance used to Pay Transactions that Night? Posting Date Before today's Business Day Cut-off Yes Today's Date AFTER today's Business Day Cut-off and BEFORE midnight* Yes Our Next Business Day Midnight or after* No Our Next Business Day *may not be midnight local time in some states, see After Business Day Cut-off Transaction Deadline table. The 2nd row in the table above illustrates that transactions made between Business Day Cut-off and midnight are included in your balance used to pay transactions that night but post to your account on our next business day. Usually on the first business day after the day we receive your deposit. However, depending on the type and amount of your deposit, we may delay the availability of your funds. If we delay the availability of funds, we send you a notice and tell you when the funds will be available. A delay may occur under the following circumstances: You deposit checks totaling more than $5,000 in one day You redeposit a check that has been returned unpaid We believe a check you deposit won't be paid You've overdrawn your account repeatedly in the last six months There is an emergency such as an equipment failure For more information on the circumstances under which a delay may occur, refer to the Deposit Agreement and Disclosures. How do I access my account? How do I find my account number? How do I find the nearest Bank of America financial center? What is a financial center? What are your hours? How do I change my address? How do I change my legal name or legal title? How do I close my account? How can I choose the best checking account for me? How do I stop payment on a personal check? How can I withdraw money from my personal checking account? How do I deposit money into my personal checking account? What does it mean if I receive a hold on my account after I have made a deposit? How can I avoid having a hold placed on my deposit? When are my funds available after deposit? How do Transactions Made After Business Day Cut-off impact my account? When are funds available after deposit? Can I get a cashier's check in a financial center? 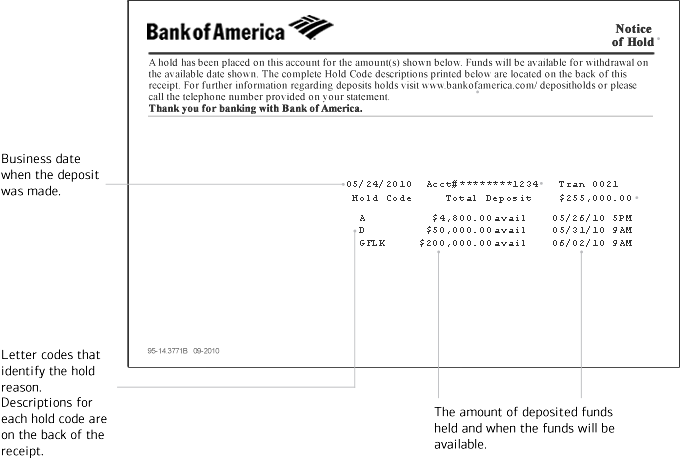 What alternatives does Bank of America offer to a cashier's check? What is a scheduled transfer? What is the bank's holiday schedule in 2019? What is the FDIC? What does the FDIC insure? What is the insurance limit? Does Bank of America participate in the FDIC’s Transaction Account Guarantee Program? How can I determine my current level of insurance coverage? Where can I get more information about FDIC insurance? What should I do if I get an abandoned property notification from Bank of America? How do I find the nearest Bank of America financial center? Use our ATM & financial center Locator. What is a financial center? Bank of America financial centers are locations where you can transact your business in person. You can use our ATM & financial center Locator to find the hours of the financial center near you. How do I change my legal name or legal title? To change your legal name or legal title: Please bring a government-issued photo ID plus any additional documentation specific to your situation to any Bank of America financial center. An associate will give you forms to complete and will assist you with obtaining a new debit card and/or credit card. If you are a co-owner or authorized user on the account: Please note that in order for us to update your name, the account owner (or other co-owners) must accompany you to the financial center. (Mon-Fri 7 a.m.-10 p.m. or Sat-Sun 8 a.m.-5 p.m., eastern time). We're sorry to hear that you want to close your account. If we can improve your banking experience with us, please let us know what we can do. Call us at 800.432.1000 if we can assist you in any way. Submit your request in writing to Bank of America, FL1-300-01-29, PO Box 25118, Tampa, FL 33622-5118. Be sure to have all account owners sign the letter and tell us how you would like to receive your balance, if any. How can I choose the best checking account for me? If you want to open a personal account, you’ll find information on Advantage Banking, account selector tools and an account comparison chart right online. How do I stop payment on a personal check? You can request a stop payment on a personal check via Online Banking or by calling customer service at 1.800.432.1000 Monday through Friday from 7 a.m. to 10 p.m.; Saturday and Sunday from 8 a.m. to 5 p.m., local time or by calling the number on your statement. To request a stop payment via Online Banking, please select the account and click Stop payment on a check under Services. Then complete the required information. You will need to provide the following information: check number, date written, exact amount, and payee. If the amount and check number are not exact, the check may be paid. The stop payment cannot be placed on an item that has already been presented. A stop payment on a personal check will be effective for 6 months. We ask that you contact us if any information on the confirmation is not correct. For further information regarding stop payments, stop payment fees or regarding bank and customer responsibilities, please refer to your Deposit Agreement and Disclosures brochure. How can I withdraw money from my personal checking account? How do I deposit money into my personal checking account? A hold means that we've received your check for deposit, but you won't be able to use the funds until the hold period has expired. Holds are placed to help protect both you and us from losses that could occur when a deposited item is returned unpaid. Hold periods are typically 2 to 5 business days, and may extend longer in unusual circumstances. If the deposited item is returned unpaid before the hold expires, those funds will not be made available to you. If the deposited item is returned after the hold expired, we charge your account for the amount of the item. We use many factors to determine if a deposit hold will be placed, including your account history, account balances, the maker, the dollar amount and type of check being deposited. If we place a hold on a deposit you make at a financial center or ATM with Teller Assist, your teller will provide you the hold notification at the time of the deposit. If we place a hold on an ATM or mobile check deposit, most often we'll notify you on the receipt or confirmation page. If we place a hold at a later time, we'll send you a notice by mail. These hold notices help prevent you from inadvertently overdrawing your account. How can I avoid having a hold placed on my deposit? Direct deposit: you can avoid having a hold placed on your check by using direct deposit instead. If you have recurring income like a paycheck, pension payment or Social Security check, arrange to receive it by direct deposit. Person-to-person transfers: consider using a person-to-person transfer through Online Banking when sending money to another Bank of America customer. It's a secure and convenient alternative to writing and sending a check. Wire transfer: we credit your account the day we receive it. Wire transfers typically have to be set up for each transfer. In most cases, there is a fee for sending or receiving a wire transfer, but it can be worth the expense since you know the money will be there when you need it. When are my funds available after deposit? By direct deposit: We credit your account on the day the deposit is scheduled to occur. In most cases, a direct deposit is the fastest and easiest way to get funds into your account. By wire transfer: We credit your account the day we receive it. Wire transfers typically have to be set up for each transfer. In most cases, there is a fee for sending or receiving a wire transfer, but it can be worth the expense since you know the money will be there when you need it. Cash with a teller or ATM: You can usually access it immediately at the teller or ATM. If you're not sure, ask your teller when the funds you deposited will be available. At an ATM (for consumer accounts): For check deposits, generally $200 of the deposit is available immediately, and the rest of your deposit is usually available the next business day. New accounts generally do not receive any immediate availability. For Business Accounts: check deposits are generally available the next business day. For more information on the circumstances under which a delay may occur, refer to the Deposit Agreement and Disclosures. How do Transactions Made After Business Day Cut-off impact my account? Certain transactions you make to your checking accounts after the business day cut-off and before midnight* are included in the balance we use to pay transactions that night. This process may impact when fees apply to your accounts. The credits can help you avoid overdrafts, returned items and related fees. However, the debits may cause you to incur overdrafts, returned items and related fees. *may not be midnight local time in some states. The following credit transactions increase your balance used to pay transactions that night: cash deposited at an ATM or at a financial center, and transfers to your account from another Bank of America deposit account made at an ATM, at a financial center, through Online Banking or through Customer Service. The following debit transactions reduce your balance used to pay transactions that night: cash withdrawals made at an ATM or at a financial center, and transfers from your account made at an ATM, at a financial center, through Online Banking or through Customer Service. To maintain a positive balance you need to ensure you have adequate funds in your account or in an account you linked for overdraft protection. Learn more about Overdraft Protection to cover these transactions. The table below shows how transactions you make affect the balance we use to pay transactions, and the date that a transaction will appear on your account statement. Included in Balance used to Pay Transactions that Night? *may not be midnight local time in some states, see After Business Day Cut-off Transaction Deadline table. The 2nd row in the table above illustrates that transactions made between Business Day Cut-off and midnight are included in your balance used to pay transactions that night but post to your account on our next business day. When are funds available after deposit? Can I get a cashier's check in a financial center? 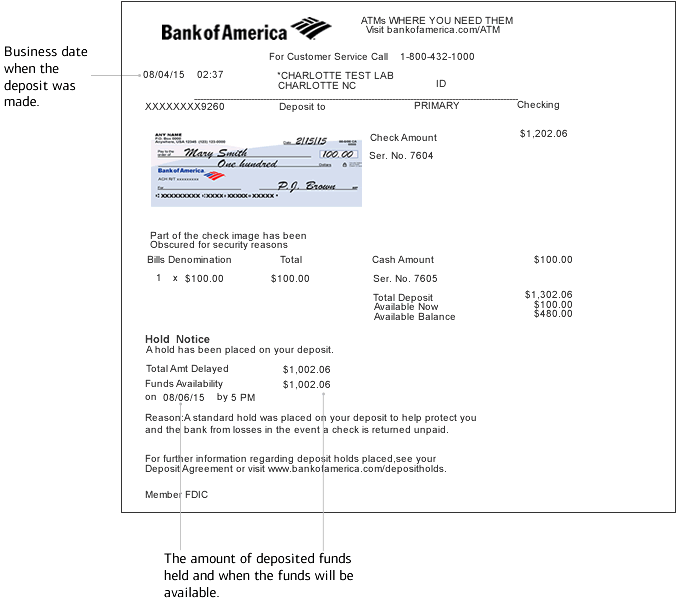 What alternatives does Bank of America offer to a cashier's check? Try one of our many convenient payment services. Zelle®, Online Bill Pay and money transfer are available in our mobile app or online. Zelle® Send money to almost anyone in minutes, no matter where they bank (up to $2,500). Through our mobile app with Zelle®, all you need is the individual’s mobile phone number or email address. Online Bill Pay Schedule recurring or one-time bill payments with Online Banking. Many bills can be paid electronically as soon as the next business day. Money transfer Transfer money to almost any individual or business quickly and securely online. What is a scheduled transfer? A scheduled transfer is a way of automatically moving money from your checking account to another checking or savings account each pay period. To set up your automatic transfers, simply sign in to Online Banking and select Transfers at the top of the page. Or, you can visit your nearest financial center, where an associate will be happy to assist you. What is the bank's holiday schedule in 2019? Please note that holidays may affect the time it takes to process certain transactions, and that updated transaction information may not display until the next business day after the holiday. The Federal Deposit Insurance Corporation (FDIC) is an independent agency of the United States government. If an FDIC-insured bank of savings association fails, the FDIC protects depositors against the loss of their insured deposits. FDIC insurance is backed by the full faith and credit of the United States government. FDIC insurance covers all types of deposit accounts (checking, savings, money market savings and CDs), as well as bank individual retirement accounts (IRAs). What is the insurance limit? Deposits in checking accounts, savings accounts, money market savings accounts and Certificates of Deposit (CDs) are insured up to $250,000 per depositor, per insured bank, for each account ownership category under the FDIC's general deposit insurance rules. Deposits in bank individual retirement accounts (IRAs) are separately insured up to $250,000 per owner. To learn more, contact the FDIC toll-free at 1.877.ASK.FDIC (1.877.275.3342) or visit www.fdic.gov layer. Does Bank of America participate in the FDIC’s Transaction Account Guarantee Program? As of January 1, 2010 Bank of America no longer participates in the FDIC's Transaction Account Guarantee program. Coverage under the FDIC's basic deposit insurance rules continues to apply. Funds held in noninterest-bearing transaction accounts will no longer be guaranteed in full under the Transaction Account Guarantee Program, but will be insured up to $250,000, per depositor, per insured bank, for each account ownership category under the FDIC's general deposits insurance rules. How can I determine my current level of insurance coverage? Calculate your insurance coverage using the FDIC’s online Electronic Deposit Insurance Estimator (EDIE) at www.fdic.gov/edie layer. Where can I get more information about FDIC insurance? Helpful information, including the "Your Insured Deposits" layer brochure, is available at the the FDIC website layer. You may also contact the FDIC by calling 1.877.ASK.FDIC (877.275.3342). What should I do if I get an abandoned property notification from Bank of America? If you have not accessed your account for an extended period (typically 3 years or more), you may receive a letter from us letting you know your account is considered abandoned and may be turned over to the state under escheat laws. You will need to follow the instructions on your letter to contact the bank and prevent escheatment. What is escheatment? Escheatment is the process of reporting and remitting abandoned/unclaimed property to the appropriate state agency for custodial safekeeping. Each state has laws that govern when accounts are considered inactive and/or abandoned and when we’re required to send a customer’s property to the state. We encourage you to sign in and check your balances regularly to keep your accounts active. Questions? Contact us at 800.432.1000.